What does it mean to be passing math class? The answer to this question varies from state to state, according to a new report released by the research arm of the Education Department, the National Center for Education Statistics. These differences are crucial as America’s population becomes more mobile, moving between states. As some parents, teachers and politicians fight the Common Core State Standards, an effort to make sure the bar for learning in math and reading is consistent nationally, the new report shows that as recently as 2013, this metric varied widely. For example, it’s possible for a fourth-grader to be passing reading in New Jersey, but as soon as he or she moves across the Hudson River to New York, to be suddenly considered failing — despite not knowing any less. “Policymakers … want to be able to compare state progress and state performance standards, but because they are all different, a common yardstick is necessary to make comparisons,” said Peggy Carr, NCES’s acting commissioner. The study defined that yardstick as the standards set for the National Assessment of Educational Progress, a low-stakes yet demanding nationally representative test considered to be the gold standard for measuring student learning. The study converted states’ cutoff points on 2012-2013 tests to where those points would fall on the NAEP scale, and the results are jarring. 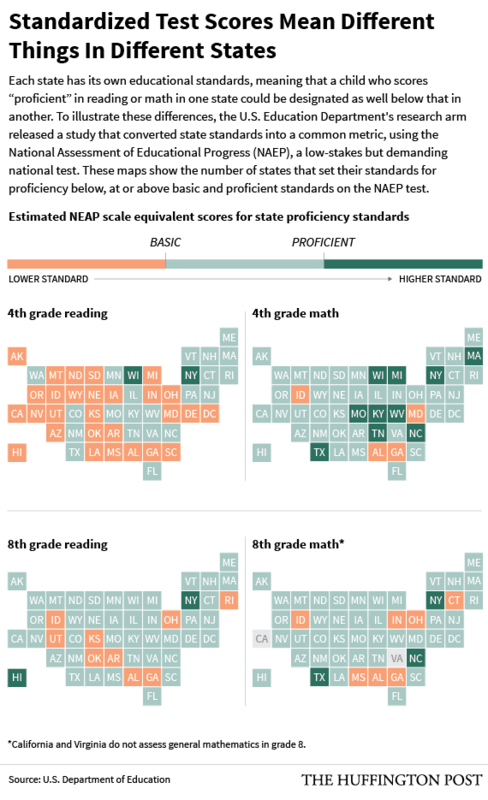 Most states set their standards within NAEP’s “basic” range, and very few state standards measured up to NAEP’s aspirational proficiency standard, which measures “mastery over challenging subject matter.” In fourth-grade reading, though, most states set their cutoff for proficiency below NAEP’s “basic” level. In that subject and grade level, states’ cutoff points spanned a range of 76 points on NAEP, a 500-point test. Overall, New York, Wisconsin, Massachusetts and Texas had the highest standards. Ohio, Georgia and Alabama fell toward the bottom. In eighth-grade reading, Georgia lagged particularly behind: Its standard for proficiency was 199, a full 18 points below the second-to-lowest state, Idaho. Over time, though, the number of states demanding higher performance for passing grades has increased, likely a result of the adoption of the Common Core. Though some states have repealed the Common Core, several of those have replaced it with similar standards. Between 2009 and 2013, the number of states that set fourth-grade reading standards at or above “basic” on NAEP increased from 15 to 25; in fourth-grade math, that number increased from 44 to 47. In eighth grade, the number of states setting their reading standards at the NAEP basic level increased from 35 in 2009 to 41 in 2013, and in math, the number increased from 39 to 49. The disparities can be revealing. For example, in 2011, 71 percent of students in both Arizona and Kentucky were said to have scored at or above proficiency in eighth-grade reading — but when converted to NAEP scores, 28 percent of Arizona students were at or above proficient, and 36 percent scored at that level in Kentucky. “If we just used the state standards, it would look like the performance in both states is similar,” Carr said. That first release caused an outcry, leading U.S. Secretary of Education Arne Duncan to admonish states for “setting the bar too low” and “lying to our children” about how much they know. Now, as Congress tries its hand at overhauling NCLB, the setting of standards is likely to be a focus yet again. The bipartisan bill currently under consideration by the Senate explicitly prohibits the government from using waivers to encourage states to adapt any set of standards. (The Obama administration’s waivers that let states wiggle out from some of NCLB’s strictures asked states for several things in return, including the use of common standards.) Late Wednesday, the House passed a Republican-sponsored bill that also contains language on preventing the federal government from influencing learning standards. Only New York State had standards within the NAEP proficiency range for both grades and subjects. Recently, New York faced a dramatic outcry for making its Regents tests significantly harder, a move that resulted in only 31.1 percent of students being deemed proficient in English Language Arts in the 2012-2013 school year. While officials celebrated this moment as a dose of honesty, some parents bemoaned the fact that they suddenly had to tell their children they had failed.